Is today’s beer all image over reality? 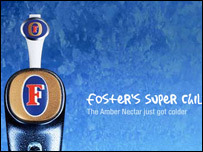 So Foster’s bought in the UK is now not only brewed here, it is also owned by a British firm. Four out of every five pints of Fosters are now brewed by a UK firm.